I have seen these flags in October in Budapest and took some photos. Concerning Ralf Hartemink site - The correct name is Budapest III. Óbuda-Békásmegyer. 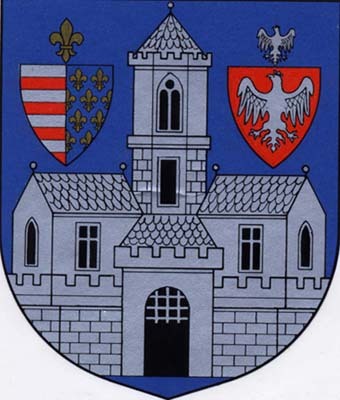 The district is the union of the formerly Óbuda town (in 1873 united with Buda and Pest cities to Budapest) and the German inhabited Békásmegyer (Krottendorf) village (united in 1950). The original blue is darker. "Óbuda's crest - The first seal, known by us was used between 1370-1380, under the ruling of King Louis The Great. It had been readapted several times until the Turkish occupation, but that design was forgotten later. At the beginning of the new age the figure of the natural lily, later the tulip was applied on the official seal as a symbol for agriculture. In 1991 the district coloured and inserted the seal-figure from the age of Anjou in its newly created crest. On the escutcheon, shaped of a triangle, in the blue field, the castle of Queen Elisabeth- the mother of King Louis the Great- can be seen, being an accurate copy of the original one. The archaeological excavations have brought the foundation onto the surface in Kálvin lane during our century. In the picture of the crest, behind the castle's silver wall there is a tower rising in the middle and on its right and left side there is a tile-roofed building with 2 windows leaning on it as a reflection. Their glaze is also silver. Above, on the one side of the tower the Anjou crest can be seen. An escutcheon divided by a triangle-shaped slash, with a field cut into 7 parts. The red and silver coloured motif in other words the Árpád stripes, referring to the relationship between the Anjou and Árpád dynasties. Opposite side Anjou lilies are filling out the space in the blue field. Above there is a golden Anjou lily floating. On the other side of the tower, also an escutcheon; in a red field, silver Piast-eagle can be seen referring to the fact, that Queen Elisabeth descended from the Polish reigning dynasty. Above the escutcheon there is a smaller version of the silver eagle"